Monarch RFID "Smart" labels, featuring Avery Dennison and alternate types of inlays, are twice tested in the factory. All "no power" and "low power" underperforming inlays are removed and replaced before they leave our building. 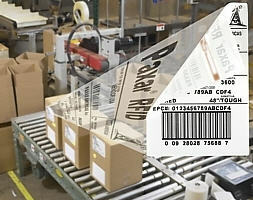 Monarch RFID "Smart" labels, featuring Avery Dennison and alternate types of inlays, are twice tested in the factory. All "no power" and "low power" underperforming inlays are removed and replaced before they leave our building. The result is, you receive as near to 100% "good" labels as possible. We are so sure of the quality of our labels, we offer the Monarch Smart Label Performance Guarantee. If any label fails to perform in your application, simply return it to us for a 100% refund- in fact, we refund 110% of the purchase price if you encoded the label in a Monarch brand printer/ encoder! Our successful label installations include Marks & Spencer, one of the world's largest users of RFID tags.